Arapaho and Shoshone people on the Wind River Reservation in Wyoming—2.2 million acres of tribal lands—released 10 genetically pure bison on November 3, 2016. Imported from the Neal Smith National Wildlife Refuge in Iowa, these animals are the first to establish a wild herd there in 131 years. 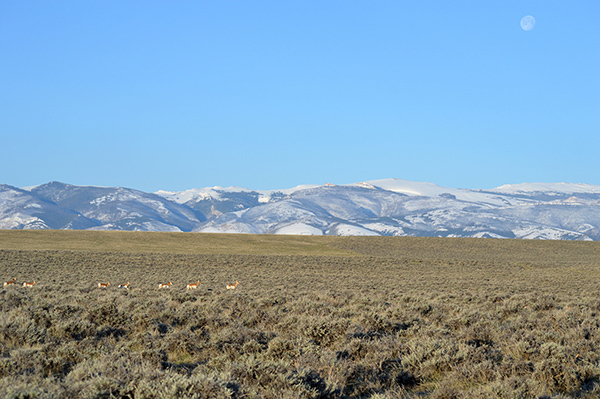 Wind River was created for the Eastern Shoshone in 1868; and 10 years later, Northern Arapaho people were moved there. For centuries, bison had provided both tribes with the major part of their existence. This spring, on May 3, 2017, there was another notable event for this herd: the first calf, a male, was born. As the number of Wind River bison grows, it is expected that the landscape they live on will blossom, too. Bison tend to graze in patches, churning and fertilizing the soil as they go. Their particular pattern of movement prevents overgrazing and stimulates forb and grass growth. Bison also roll on the ground—or “wallow”—to get rid of flies or molted tufts of fur. This leaves large depressions in the earth that can hold water from rain or snowmelt, creating microhabitats for amphibians, other wildlife and water-dependent grasses. And unlike cattle, bison do not trample riparian areas, leaving these critical habitats intact. In fact, a study published in the journal Science showed that a loss of grassland species diversity could be reversed by the grazing of herbivorous mammals, such as bison. 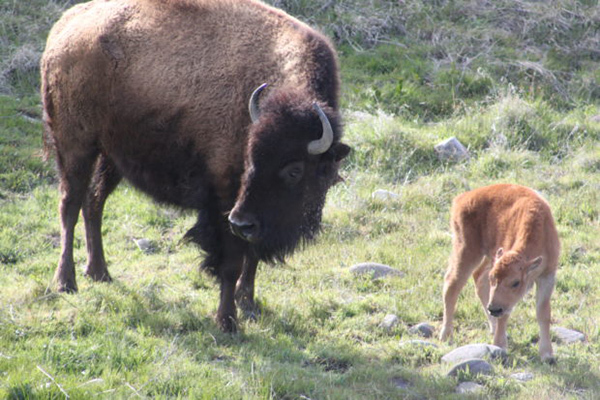 Burrowing owls, ferruginous hawks and mountain plovers all benefit from the presence of bison. Watch the two-minute video below from KTWO News in Wyoming about the birth of the Wind River herd’s first calf. Because the Wind River Reservation has more potential habitat for bison than Yellowstone National Park, the ultimate goal is to repopulate 500,000 acres of these tribal lands with 1,000 bison. In the meantime, this small, little calf, it is hoped, is just the start of much bigger things to come.